I don't know how this happened as I am usually extremely careful when creating accounts to extract the master phrases. Is it possible when I signed up to MyNxt.info in 2015 that there were no master passwords then? Is there anything I can do? If I could download the encrypted file then perhaps I could try all passwords in my password vault? Any ideas? myNXT has always used a master password, and only the user has a copy of it for security reasons. 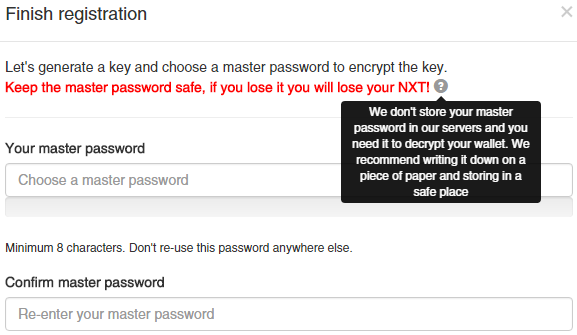 In order to download a myNXT wallet backup, even encrypted, you need to provide the account master password, so if you have multiple password candidates that could work maybe you can try them at Settings > Security > Download Wallet Backup. Ouch. Ok. So is there any method which I could try a brute force offline? I am hoping that I will find the master password sometime in the future but worried that after mynxt.info is shut down I will have no way to access the wallet. Would the master password be something that was generated by the client? Or would it be something that I created? Let's try to clarify this again. - You provided that master password and its importance was clearly stated. - If you lost it, I'm sorry but there's nothing we can do. myNXT has no copy of it, and cannot access users accounts because they are encrypted with the master password you provided. - myNXT uses very strong encryption methods, and trying to bruteforce an unknown master password is not an option. - If you did save your master password, but returns an error when you enter it, maybe there is a typographic error somewhere in the master password you saved. A community member has a tool that can help bruteforce a myNXT master password when there is a small amount of possible variations to try. If this is your case, send me a personal message and I'll put you in touch with him. - But one last time: If you lost your myNXT master password, and as warned during account registration, there's nothing we can do to recover it. I'm sorry. I totally understand that I messed up and it is my resposibility to keep the master password safe. Greatly appreciate your assistance. Thank you very much for your help and for the detailed post.